Instead of being a dour task on the checklist, what if the process of homily prep renewed you? Instead of feeling insecure about your message, what if your skills made you confident to preach a consistently clear message of Good News, authentic to you, relevant to your listeners, holding their attention and inviting transformation? Backstory Preaching: Integrating Life, Spirituality, and Craft shows you how. By integrating your life and spirituality with the practical skills necessary for effective preaching, you can move beyond the boredom, stress, or insecurity of preaching so it is no longer you who preach but Christ who preaches in you. By connecting with God in the midst of your sermon prep, the Gospel will be spread deeper and further. God’s joy—and yours—will be made complete. The Revd Lisa Kraske Cressman, DMin, has been noted for her preaching for twenty-five years. An Episcopal priest, preaching instructor, spiritual director, and retreat leader, she is founder and steward of Backstory Preaching®. Long ago, Aristotle said that one of the three key ingredients in an effective communication situation is ethos, the listener's perception of the character of the speaker. Lisa Cressman goes significantly farther by emphasizing that the character, the person, of the preacher is formative for preachers themselves. We prepare for preaching by becoming people whose life is shaped by the gospel so that preaching is an authentic expression of who we are. The book helps preachers become aware in a critical way of the backstories that are at work in us and that inevitably contribute to our preaching, and she shows us how to deepen and broaden those stories through the practice of lectio divina. 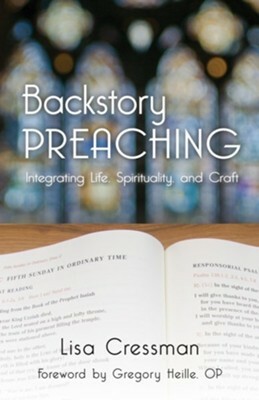 Backstory Preaching brings sermon formation and spiritual formation into a richly textured conversation. Cressman argues that life-giving sermons emerge within relationships of deep trust, shaped by spiritual authenticity and truth-telling. Reading this book and taking the suggested practices to heart will not only improve your preaching, but may also change your preaching ministry into a life-long spiritual journey. For every preacher who has wished for a trusted colleague with whom to share wisdom and insight about the craft of preaching, Lisa Cressman is a true find. An accomplished preacher herself, she writes candidly, conversationally, and compassionately-preacher-to-preacher, friend-to-friend-about both the stress and joy of crafting sermons. There is much valuable and practical advice to be gleaned in this volume, but the main virtue of this book is Cressman's compelling vision of the preaching task, so deeply rooted in prayer and so firmly focused on the gospel. "You're the only one who knows God the way you do, the only one who can reveal God to us the way you can." This is the heart of this book on preaching. So much literature on homiletics focuses on the homily and ignores the homiletician. The Rev'd Cressman offers us a book that gives a word of grace into this omission. Preachers who pick up this book will sit down for a wide-ranging, free-wheeling, vividly focused conversation with a colleague-one who knows firsthand, and who names succinctly not just the "in's and out's," but the "up's and down's" of the vocation you share. With art and energy, Lisa Cressman has written not a textbook for preaching, but a spirituality of preaching-one pervaded with compassionate wisdom and practical strategies for soul formation, sermon formation, and the disciplined practices of heart and mind that bring both together in a lifegiving process of mutually creative nurture. Unequivocal about the demands of the vocation and the disciplines it requires, she demonstrates how the duties of preaching can become sources of personal delight. It is true that clergy who have worked with The Rev. Lisa Cressman and have practiced the Backstory Preaching method are better preachers for having done so. However, this is no mere prescription to heal what ails the preacher's performance. Cressman invites nothing less than the renewal of the art of preaching in our time through the renewal of the preacher's soul for the sake of the Gospel. Through the integration of one's own life and spirituality into this vessel called a sermon, Cressman invites each reader and practitioner to discover that we ourselves are Good News. Most works of homiletics help preachers identify the message they hope to convey, the methods they might use to convey it, the factors that constrain or facilitate the hearers' acceptance of the message, etc. The Rev'd Lisa Kraske Cressman's Backstory Preaching concentrates instead on the preacher, asserting that it is impossible to preach effectively without praying regularly. She adapts the four stages of lectio divina (lectio = "reading"; meditation = "hunting for meaning(s)"; oratio = "expressing the meaning(s)"; contemplation = resting) for praying a sermon into being. An eminently practical contribution to homiletics, Cressman's work is marked by helpful anecdotes, useful summaries and an online "workshop" inviting the reader to integrate its concepts not only in completed sermons but in developing one's spirituality. This is an honest book offering real hope. I look forward to using the big insights of this little book with both beginning and seasoned preachers. I'm the author/artist and I want to review Backstory Preaching: Integrating Life, Spirituality, and Craft.